Does your sweetheart have a sweet tooth? Deliver 12 red roses elegantly nestled in our stylish rose presentation box, accompanied by a naughty 20 piece box of sweet chocolate treats - guaranteed to rock their world! The combination of our 50cm long stem Colombian red roses and chocolates for Valentine`s Day are simply the bomb when it comes to making your other half feel over the moon! 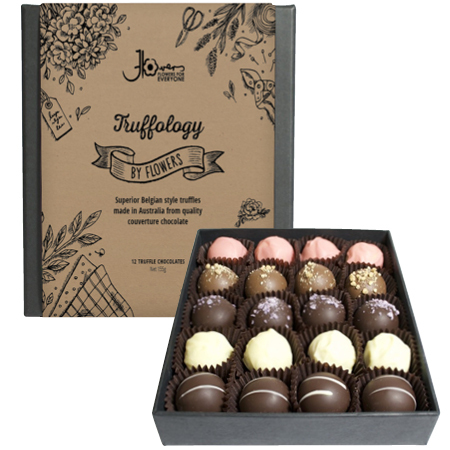 One gift for the eyes, the other for the lips...And these premium Belgian-style assorted chocolate truffles, handmade with top quality couverture chocolate, are the perfect little addition for a romantic night to celebrate your love! Order your red roses and chocolate truffles delivered for Valentines Day via this online florist store, email our fabulous love cupid floral consultants at sales@flowersforeveryone.com.au or give us a call on 1800 66 66 46. Our truffles contain milk, soy (lecithin), tree nuts and alcohol. They may contain traces of peanuts and gluten. Please Note: We are UNABLE TO GUARANTEE SPECIFIC DELIVERY TIMES on Valentine`s Day. All flower deliveries will be made anytime between 7am to 5.00pm (work addresses) and 7 - 7pm (home addresses). No re-directs will be possible if the recipient has left the delivery address for the day, however we will try, where at all possible, to accommodate your needs if this situation does arise. Also note that no changes to orders can be made after 18:00 AEST Thursday 7th February for Thursday 14th deliveries. Please make sure to double check all your contact information, addresses and additional delivery instructions when ordering your roses online for Valentine`s Day to ensure smooth delivery! 2019-02-21 Service rating : Offered same day delivery, did not deliver and did not tell me that they could not even though they knew about the error. Only found out when I chased to ask where the delivery and they said they are delivering the next day. What wants Valentine flowers the next day. When I spoke to them about it they didn’t care. DO NOT USE THEM! 2019-02-21 Great service, thank you.